Last night, Phoenix Books in Burlington, Vermont, hosted the “Green Writers Press Celebration Party.” What a great event! Photos TK. Here is the swell poster Kristen at Phoenix made. 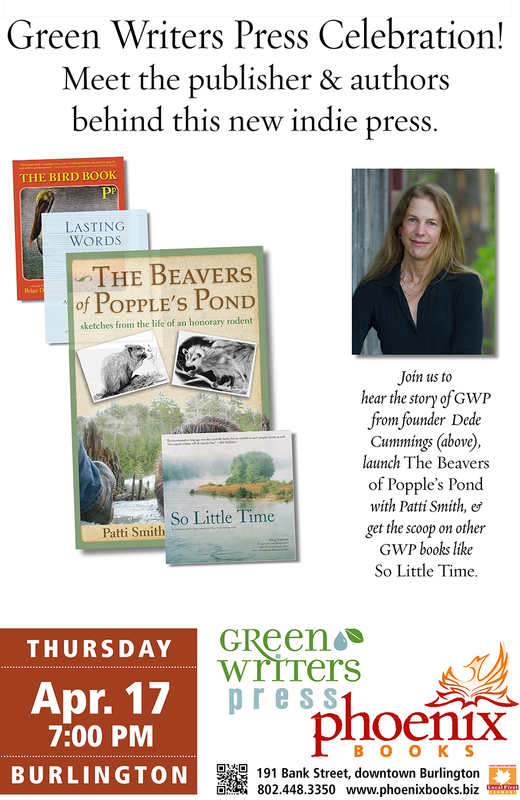 Join us to meet Dede Cummings, the publisher behind Green Writers Press, as well as authors from the new press. Phoenix Books is partnering with GWP — a new, Vermont-based publisher that prints their books in Vermont and seeks to change the way books are printed by using only post-consumer waste paper and not virgin timber — to celebrate this new indie publisher. 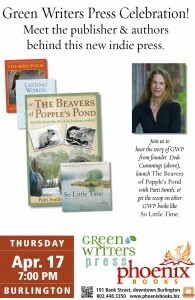 We’ll launch GWP’s newest title, The Beavers of Popple’s Pond, by Vermont nature writer Patti A. Smith, and get the scoop on other titles like So Little Time. We have lots of news to share and our actual newsletter is coming out next month! Stay tuned. If you haven’t already signed up for our newsletter, you can do so on the sidebar here. Thanks for everyone’s support! We are growing, and books are selling, and our community is part of why that is happening—we are grateful for the outpouring of support we have received! 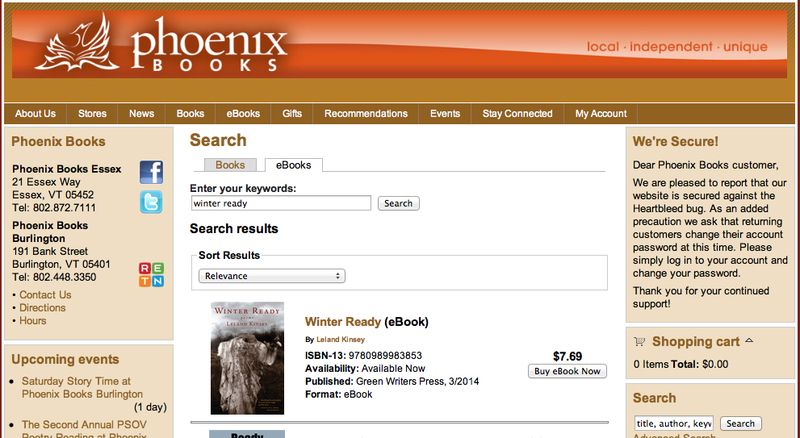 This entry was posted in Publishing News and tagged books, eBooks, indiebound, Leland Kinsey, Midpoint Trade Books, Patti A. Smith, Phoenix Books, spring, The Beavers of Popple's Pond, vermont, Winter Ready on April 18, 2014 by Dede Cummings.